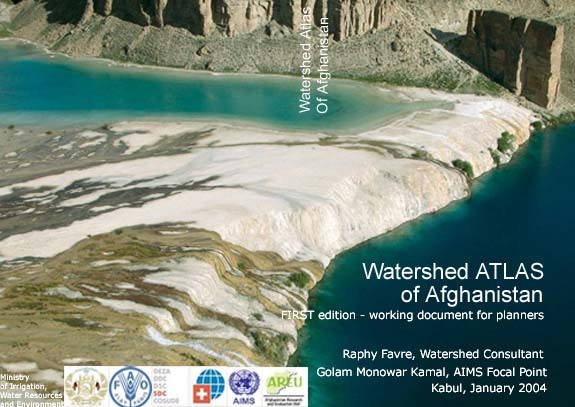 This vital publication is a major resource for development agencies requiring hydrological information on Afghanistan. The Watershed Atlas has the objective of supporting natural resource management in Afghanistan with a planning tool in the form of geo-referenced watershed maps. The watershed maps have been prepared using Arc-View software and are fully compatible for area-based statistical analysis. They can be overlaid with any other geo-referenced maps on Afghanistan. The Atlas provides two levels of catchment classification: River Basins; Five River Basins have been defined in Afghanistan and Watersheds; 41 Watersheds, which includes five non-drainage areas, have been defined in Afghanistan. The immediate applications include hydrology, climatology and agriculture production analysis and monitoring. The Watershed Atlas of Afghanistan also provides information on watershed development initiatives, natural resources, climate, agriculture and a set of statistical data presented by watershed and river basins. The Atlas also offers 142 geo-referenced pictures and panoramic views in all regions of Afghanistan which illustrate features of river basins, watersheds and natural resources and constitute a visual database for natural resources monitoring. Furthermore, the hydrology database of Afghanistan, pictures and river basin/watershed vectors are available on this website. One of the Atlas key premises is that improving water use efficiency is essential to achieving smooth and sustainable development of both Afghanistan and neighboring countries. In the Afghan context the authors have underlined the strategic importance of a more detailed classification for community watershed management work. Preliminary work on defining social groups indicates that their numbers may be somewhere between 3000 and 4000. The research concludes that identifying, mapping the territory and working closely with these social groups are essential to successful watershed and natural resources management. Part I: Overview of the climatic, water and natural resources context of Afghanistan. Several maps are presented on climate, mountain ranges and tectonics, snow cover satellite imageries, locations of climatic and hydrological stations and existing and proposed dams. Also, tables on planned hydropower sector dam projects, sources of irrigation and formal irrigation schemes are presented. Finally, a brief discussion on watershed management in Afghanistan is made with a number of pictures illustrating major issues on watershed and natural resources management. Part II: Discussion on methodology for the classification and delineation of river basin and watershed boundaries. This section proposes a terminology for four levels of water catchments areas for Afghanistan. Part III: Description of the 5 river basins of Afghanistan. Includes discussions on the trans-boundaries riparian situation, hydrological infrastructures, environment and natural resources issues, agriculture patterns and main historical developments along water sources. Part IV: Description of the 41 watersheds of Afghanistan. Includes discussions on watershed features, sources of rivers and tributaries, land cover and the importance of agriculture land and graphs on water flow discharge based on the yearly Hydrological Book data compiled by the Ministry of Irrigation. Part V: Conclusion and recommendations, acknowledgments and bibliography. The Atlas has been produced by the Ministry of Irrigation, the Food and Agriculture Organization (FAO), Afghanistan Information Management Service (AIMS), the Afghan Research and Evaluation Unit (AREU) and the Swiss Development and Cooperation (SDC). The Atlas benefited from one year of informal and voluntary collaborative field and mapping work undertaken by the authors in 2003. Copyright © 2007 AIZON PLC. All rights reserved.